All lumber and heavy timbers are not created equal—even those that are cut from the same tree species. If you’re thinking about adding a barn to your property, your building’s lumber quality is an important consideration.The quality of the timbers you use for your building will determine the health, beauty and longevity of your timber frame. Lumber’s grade, cut and moisture content all add to the durability and appearance of a building . For example, improperly cut and dried lumber of a low grade is prone to warp and shrink over time. This will alter the barn’s aesthetic and structural integrity. The Pacific Northwest’s reputation for quality heavy timbers is second to none. 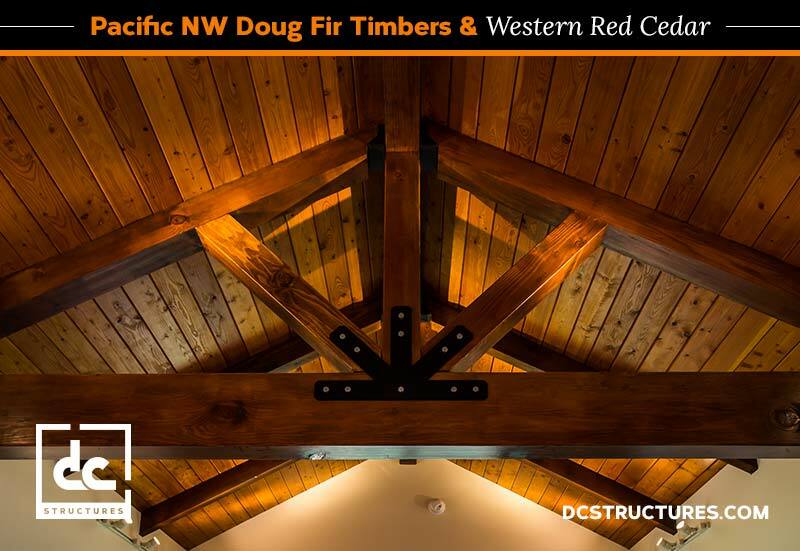 As an illustration, Western red cedar and builder-favorite Douglas fir are among the region’s largest exports. Nationwide barn kit builder DC Structures is in the heart of the logging scene. Consequently, we benefit from meaningful, mill-direct relationships with our high-grade lumber suppliers. We believe that the end result for a client’s barn kit project depends on the quality of materials sourced and services rendered. As a result, our team is very knowledgeable when it comes to the materials included in our packages. We are always happy to provide guidance throughout the process of deciding on the right timbers for a barn kit build. All DC Structures barn kits come standard with Select Structural grade timbers, which is the highest recommendation for structural integrity. Therefore, you’ll never have to question or negotiate for a better grade of lumber. The same is true of lumber cut. All our barn kit’s timbers are free of heart center. This means the soft pith in the middle is excluded from the trim. Free-of-heart timbers make for frames that hold their shape and appearance over time, as the soft heart center will likely shrink and twist in the process. Heavy timbers that are cut to include the soft heart center are prone to cracking over time. Similarly, improperly dehydrated wood is prone to sap and poor structural stability. All timbers included in DC Structures’ pre-engineered barn packages have been subject to precise and efficient kiln drying techniques. This ensures that the lumber’s moisture content is well below concerning levels. All DC Structures come with a promise of quality that permeates every aspect of our product and service offerings. That includes top-grade, hand-selected heavy timbers from our mill-direct connections. The DC Structures project gallery is a testament to the excellence of our barn kits. Request a catalog to see our quality promise in action.